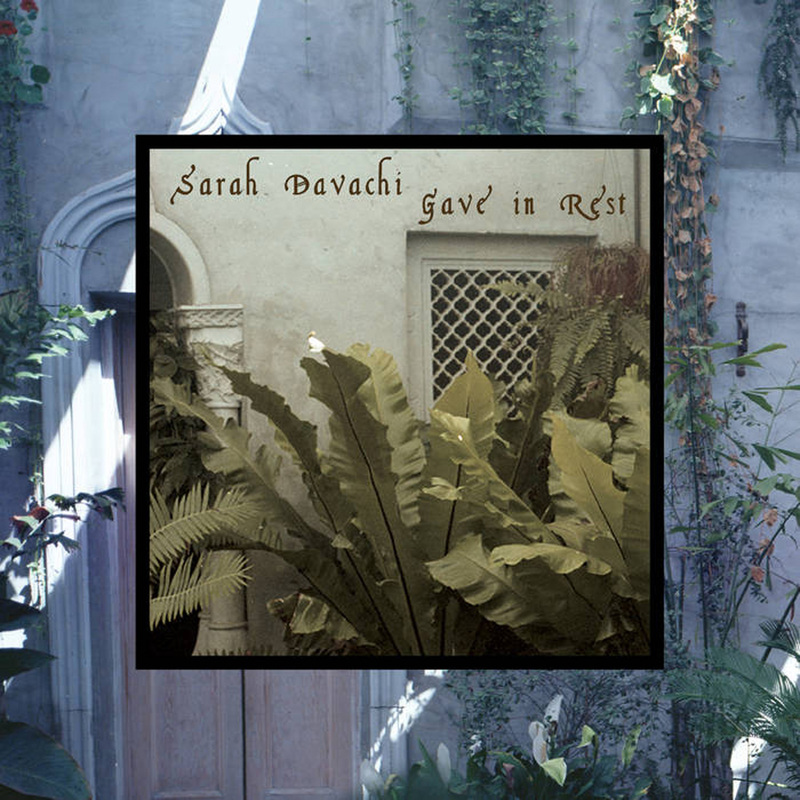 Brainwashed - Sarah Davachi, "Gave In Rest"
Sarah Davachi, "Gave In Rest"
This latest album, Davachi's second of the year, continues the compelling and accelerating evolution of her distinctive vision. In fact, Gave in Rest features some of her most experimental and uncategorizable work to date, incorporating Renaissance-era instrumentation and compositional ideas to create something resembling a spectral secular mass of sorts. While the results of this ambitious divergence can occasionally feel sketch-like, uneven, or less than seamless as Davachi explores unusual structures or revels in the joy of pure sound, the bulk of the album is quite good and a few pieces are absolutely sublime. Even if it does not quite rank among Davachi's strongest releases, Gave in Rest is the album that departs most radically from her comfort zone and delves the deepest into unexplored territory. The last year or so has been one of considerable creative and personal upheaval for Sarah Davachi, relocating from her home in Vancouver to Los Angeles, with an extended detour into Europe along the way. It was that period of relative rootlessness in Europe that arguably had the greatest impact on shaping the direction of Gave in Rest, as she spent a lot of time in churches–sometimes performing in them, but more frequently just basking in the calming atmosphere and reflecting upon the textures and interplay of various instruments in that unique acoustic environment. Consequently, it is no surprise that most of the instrumentation used for this album falls very much within traditional "church" territory, or at least sounds like it does (there are allegedly some synthesizers sneakily lurking amongst all the organ, piano, mellotron, and choral voices). Aside from that, Davachi's deep interest in early music additionally manifests itself in a curious fondness for the recorder. In fact, the recorder is the sole instrument in the album's deeply unusual and abstract opening piece "Auster." It is a very perplexing choice to open the album, as it is more of a fragmented meditation on the properties of the instrument than it is a composition: Terri Hron played a sequential series of sustained pitches and Davachi time-stretched them into a blurred and oscillating haze. It is an interesting idea, but it never becomes anything more than a slow-motion flow of disconnected tones, making it more of an extended prelude than a substantial part of the album (despite being the longest piece). It kind of sounds like a badly warped VHS tape of someone holding a single note on a '70s synth, then arbitrarily changing to another note...and then another, etc. With deep and attentive listening, there is definitely some intriguing microcosmic activity to appreciate, but I wish the piece had eventually transcended its initial theme rather than just lingered there. After "Auster," the album begins in earnest with a pair of absolutely gorgeous and harmonically rich pieces. The first, "Third Hour" is built from an eerily wraithlike and gently undulating drone that slowly blossoms into a darkly beautiful dance of intertwining violin melodies from guest Jessica Moss. More than any other piece on the album, "Third Hour" achieves a hauntingly effective balance between the corporeal (the tormented violins) and the incorporeal (the smoky, billowing drones), as well as an emotional power from shifting swirls of uneasy harmonies. The elegiac "Evensong," on the other hand, sounds like a ghost mass, as mournful angelic voices flutter around a somber piano motif. The rest of the album is quite good as well, but it is more focused on experimentation than beauty, though the two occasionally blur together at times. The best piece among the remainder is "Matins," which is an extended exercise in layered and subtly transforming pastoral drone that is inventively curdled by uncomfortably harmonizing and stammering flute-like tones. Elsewhere, "Gloaming" and "Gilded" more explicitly explore Davachi’s recent fascination with achieving a kind of indistinct, floating stasis, as both resemble a hazy locked groove that glacially blossoms into a fragile, understated crescendo. In fact, "blossoms" is exactly the right word, as each feels like watching a flower slowly bloom via time-lapse photography. The pendulum unexpectedly swings the other way for the closing "Waking," however, as it captures a long, unaugmented take of Davachi playing a Baroque-inspired organ motif. Like the other bookend "Auster," there is only one instrument, yet "Waking" is otherwise its complete opposite: rather than remaining in relative stasis and quietly exploring harmonies, "Waking" is beautifully melodic and bittersweetly melancholic. While it is superficially quite a traditional piece that would not raise any eyebrows in a church service, it is sneakily one of the most compelling and quietly stunning pieces on the album, as the trail of harmonies that the slow-moving melody leaves in its wake is both heavenly and hallucinatory. Between "Waking," "Evensong," and "Third Hour," Gave in Rest essentially amounts to a half-great album that fitfully features some of Davachi’s strongest moments and many of her most unconventional ideas. The only real caveat is that not all of her ideas made the leap into fully formed compositions. As such, this is probably not the best album for the curious to introduce themselves to Davachi's oeuvre, though fans will certainly appreciate her willingness to break new ground and avoid repeating herself. I certainly enjoyed it, though I hope she continues to explore this direction further, as Gave In Rest feels more like a promising taste of a compelling new vision than it does its definitive statement.